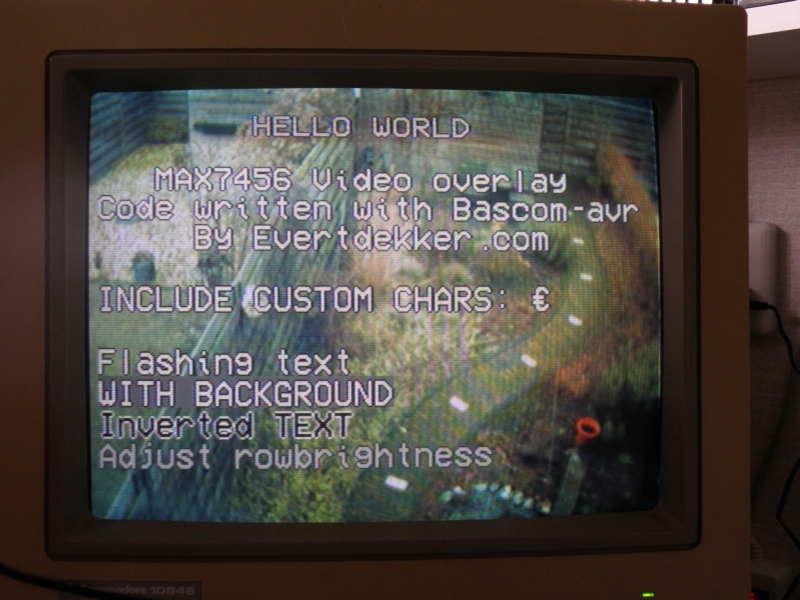 The Max7456 from Maxim is a monochrome video overlay chip. With this you can overlay text and simple graphics over your PAL or NTSC video signal. You can also use it with no overlay, just like a simple monitor. Included in this sample is a tutorial how you cam make your own characters with my converter tool. This tool converts the Maxim mcm files to Bascom data lines. There are some controle characters implanted to controle (part of) the string. Because the max7456 has NVM memory (eeprom) the writecustomercharacter routine only needs to be used one’s. The custom characters wil be left in the NVM memory even after power lost. Converter tool , to convert the mcm file. And for the people who want to take it a step further, here a nice site (In German language) where is showed how to make your own graphics. Update: 2009-03-24, Bug in the Bascom code and in the Converter tool, both fixed . 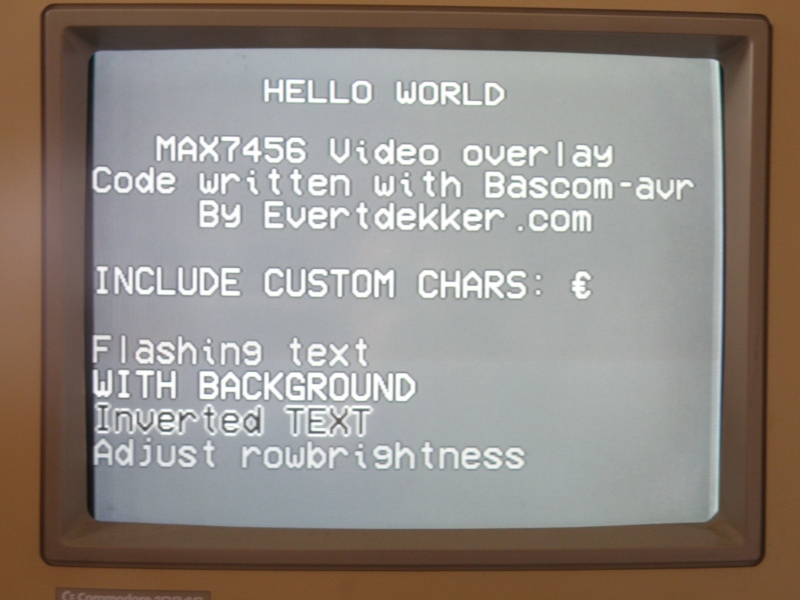 -Bascom: Max7456 was disabled in the Writecustomcharacter sub routine, but not enabled at the end of the sub. 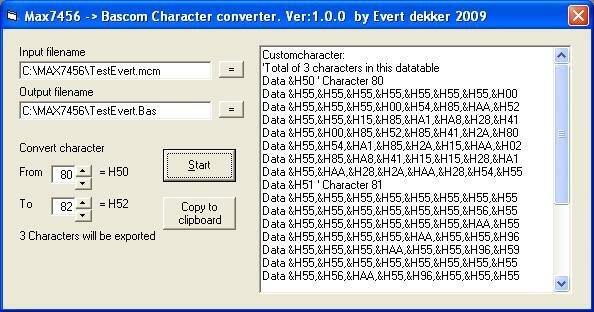 -Converter tool: loops in exportarray was counting to 56 instead of 54, removed the loops and made fixed lines. Writecustomcharacter 3                                      'Write the customcharacters to the MAX7456 NVM, this has only need to be done one's. This line and data can be removed after that. i tryed your converter! It dont work. Same problem here under win10-64, run button stays greyed out. This had something to do with incompatible comdlg32.ocx. Recompiled the software and it works on my pc fine now. Remove the software from your pc, download it again and after reinstalling is the problem should be gone. why do use such clock. Isn’t it pissoble to use 8 or 16 MHz. I’m using a 7,372800 Mhz clock because it will give a 0% error on the serial port. The Max7456 and serial port will also work fine with 8 or 16Mhz.